The Blues came away from Belarus with four wins out of four in the Europa League thanks to Olivier Giroud’s first goal since May. It was a brilliant header by the Frenchman which turned out to be the game’s most decisive moment. You could see the joy in his face upon scoring his goal, a much needed goal scoring boost for the World Cup winner. Chelsea headed out to Eastern Europe without midfielder Cesc Fabregas due to illness, while Eden Hazard travelled and started in the early evening kick-off. Defensively from left to right, Emerson started yet another Europa League tie with Christensen, Cahill and Zappacosta forming the back four. Arrizabalaga kept his place in goal. A surprise move by Sarri saw Loftus-Cheek start alongside his compatriot Ross Barkley. Jorginho completed midfield. Hazard slotted in on the left of attack with Giroud in the middle and Pedro on the right hand side. Chelsea didn’t seem to warm too much to the game in the initial stages as Bate threatened in the 12th minute, rattling a shot against the post from range via Baga. The opportunity served as a fierce reminder to the visitors that BATE weren’t going to be taken lightly this evening. The Belarusian side however sat back not long after and it became almost attack vs defence at times. Chelsea needed to show what their side was worth after a very dull start. In the 37th minute Emerson shot just wide of BATE’s post with the Blues starting to really push for that goal before half time. Giroud came close spinning a ball just wide off his head from a Hazard corner not long after. Half time came and it would be fair to say Chelsea were too pedestrian. The Blues needed some midfield magic of Fabregas or Kovacic to spark up this fixture and help create some more chances. BATE admittedly were keeping it real tight at the back with their defensive shape. Giroud finally got a header past Scherbitski in the 52nd minute thanks to a nicely whipped in cross from left-back Emerson (probably Chelsea’s best player of the tournament). It was Olivier’s 18th goal in Europe overall. The English side still had to be extremely wary as Bate hit the crossbar from close range soon after the Chelsea goal. Then in the 60th minute Bate spurned a chance from the middle of the penalty area, going just over the bar. It was an absolute let off again for Chelsea – The Blues really needed a crucial second goal. Chances came and went for the Pensioners not long after as Barkley shot from far, on target but the keeper pushed away. The resulting corner fell to Giroud who headed straight at the keeper who palmed it over. Willian swapped for Hazard who had a very quiet game in the 63rd minute. In the 75th minute Willian managed to get wide and fizzed a cross to Barkley, the England man was unlucky to get on the end of it. Jorginho picked the ball up from distance and hit his shot wide. As the game drew to a close, Borisov started to up the gears as they came ridiculously close to securing a famous draw. BATE gained a 90th minute corner which swung into the box and ping-ponged in the area. BATE were not going to get a better chance. A chance to shoot fell to Berezkin who hit the post but was hacked away by a Chelsea leg for a corner. However the resulting set piece was cleared in a much better manner and the visitors hung on. 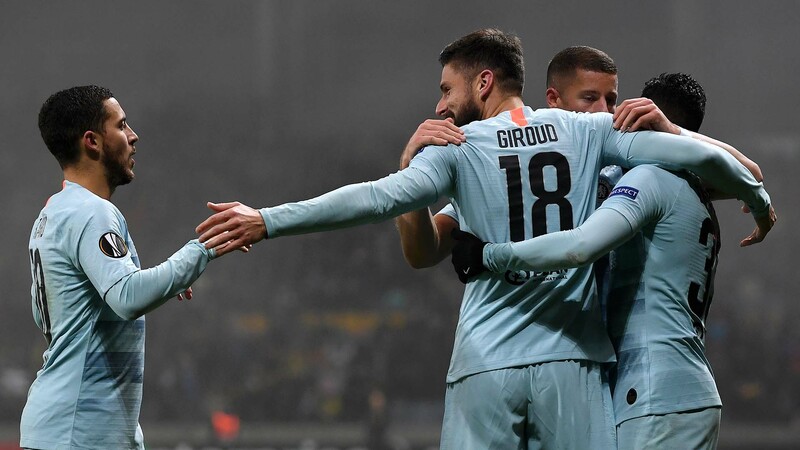 Three very lucky points and a group stage win secured Chelsea place in the next stage of the Europa League. Next time lucky then Blues.. Lets just hope this hit and miss defence tightens up!